← How to erase a block of information on a scanned PDF? How to convert text based PDF to PowerPoint through software interface? 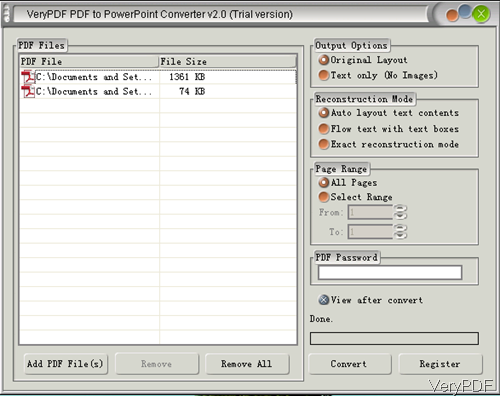 In this article, VeryPDF will show you one method of converting text based PDF to PPT through software interface. This method is good for those who do not have too much knowledge in software and like easy-to-use GUI version software. The software I will use is VeryPDF PDF to PowerPoint Converter, which is a useful tool designed to help you convert PDF to PowerPoint (PPT) with high quality. In the following part, I will show you how to use this software. Download PDF to PowerPoint Converter and install it by double clicking the exe in downloading folder. The downloading will end in a few seconds as it is quite small. When installation finishes, there will be an icon on the desktop. Simply click it then you can launch this software. The following snapshot is from the software interface. 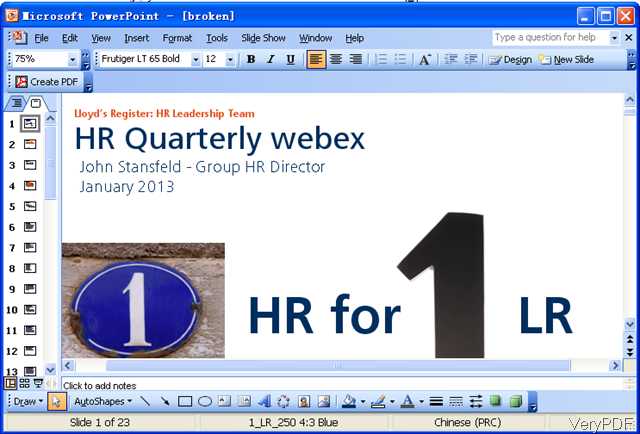 PowerPoint application installed as this software can not run the conversion without Office PowerPoint application installed. When you tell whether the PDF is text based, please use the following method. Try to copy and paste in PDF file like the following snapshot. 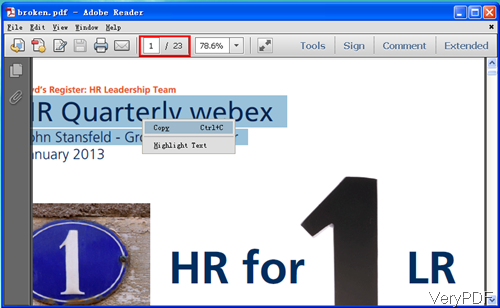 Then please add PDF files to software interface by dragging from its containing folder or you can click button Add. When adding PDF files, there is no limit about how many you can add. Once you add, they will be shown in the list. In the right part, please choose options according to your needs. This software allows you to output as original layout or only keep the text part. There are three reconstruction modes for you to choose: auto layout text content, flow text with text box, exact reconstruction mode. It also allows you to choose conversion page range. When conversion text based PDF, there is no language limited. It can convert English, French, German, Italian, Spanish, Swedish, Danish, Dutch, Norwegian, Polish, Portuguese, Russian, Czech, Chinese Simplified, Chinese Traditional, Japanese, Korean, etc. PDF to PPT. It also can be used to convert password protected PDF to PPT on the condition that you have right to use it. When finish setting, click button Convert then the conversion will be launched. During the using, if you have any question, please contact us as soon as possible. In the next article, I will show you how to covert image based PDF to PPT, please pay attention to our website. How to convert image based PDF to PowerPoint through software interface? How to convert pdf to PowerPoint 2003? I want to add one of pictures in pdf file to my PowerPoint,how to make it? This entry was posted in PDF to PowerPoint and tagged pdf to ppt. Bookmark the permalink.